Beat together the cream cheese, confectioners’ sugar, and vanilla extract in a bowl until smooth. Spoon the mixture into a piping bag fitted with a large round tip. With a sharp paring knife, cut a cone shape out of the top of each strawberry to leave a small hollow. Pipe about 1 tablespoon of the cream cheese filling into each strawberry, making sure that the filling overflows a bit out of the top of the strawberry. Place the graham cracker crumbs into a shallow bowl. 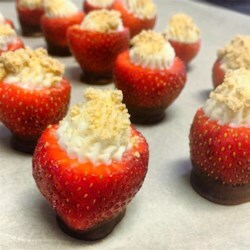 Dip the filled side of the strawberry into the graham cracker crumbs, coating the exposed filling with crumbs. Melt the chocolate and canola oil in a microwave-safe glass or ceramic bowl in 30-second intervals, stirring after each interval, until warm and smooth, 1 to 3 minutes (depending on your microwave). Dip the unfilled ends of the strawberries into the melted chocolate and place on the prepared baking sheet; refrigerate until set.